Ho Chi Minh City is poised to construct a new bridge spanning its major river, creating an additional route for commuters who wish to cross the waterway. The municipal People’s Committee has assigned the Thaison Group and the Vietnam Infrastructure and Property Development (VIPD) Group to the planning of the Thu Thiem 3 Bridge. The structure is designed to connect District 2 and 4, which are separated by the Saigon River. 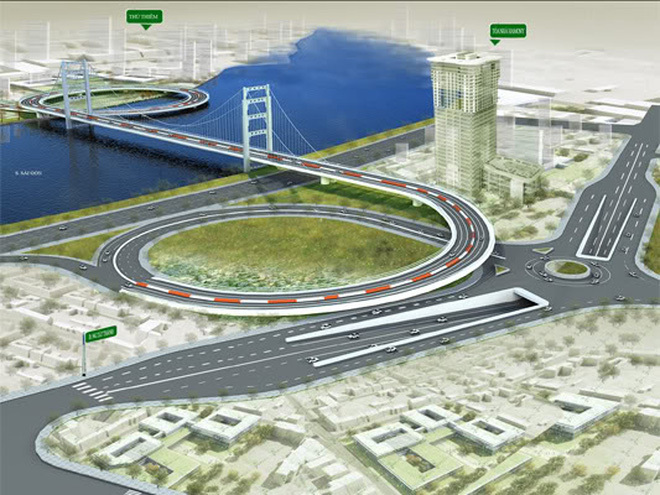 The bridge will begin at Ton Dan Street in District 4, cross Nguyen Tat Thanh Street, span over the Saigon River, and end at the Thu Thiem New Urban Area in District 2. The project also includes the expansion and upgrade of Ton Dan Street under a PPP (public–private partnership) arrangement. A PPP is a government service or private business venture that is funded and operated through a partnership of government and one or more private sector companies. According to the city’s transport planning, a total of 21 bridges and tunnels will be built to provide access across the Saigon River, of which 14 have already been constructed. Construction of the Thu Thiem 2 Bridge, which connects District 1 and 2, has been initiated and is expected to be completed by 2018. The Thu Thiem 4 will also be built in the future to link District 7 and 2.